1. Slice the aubergine and courgettes lengthwise into slices approximately 1cm thick (about 6 slices from the aubergine and 3 each from the courgettes, discarding the end pieces). Cut the sides and bottom off the pepper, discarding the stalk and seeds. In a large bowl brush the aubergine, courgettes, pepper and beans in 1 tbsp oil and season with salt. 2. Heat a griddle or frying pan until nice and hot. Once hot add 1 tbsp of oil. Cook the aubergines, courgettes and peppers, in batches if necessary, for 4-5 minutes for the aubergine and courgettes and 7-8 minutes for the peppers. Add the beans for the last 3-4 minutes of cooking, until all the veg is wonderfully soft and charred looking. When cooking the aubergine, make sure to cook them fully – often people have a bad impression of aubergine as it can be undercooked and rubbery. Sprinkle the beans with a small pinch of salt straight after taking them from the pan. 3. Cut the cooked pepper into 12 x 1cm strips. Slice the avocado in half, remove the stone and skin. Then cut into 12 long thin slices. 4. 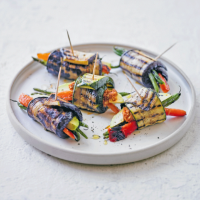 Lay the grilled aubergine and courgette slices lengthways, add a teaspoon of pesto or hummus, about one-third of the way from the bottom of each one. Add a slice of avocado on top, followed by 3-4 beans and a strip of pepper. Now roll them up. Hold in place with a cocktail stick until serving if needed.